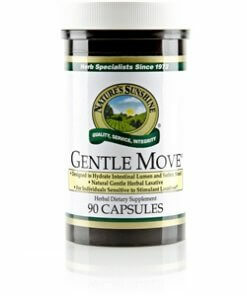 Nature’s Sunshine Gentle Move® works as a laxative for the intestinal system. This magnesium hydroxide and herbal blend includes Triphala extract an Ayurvedic formula, that supports intestinal health and works as a gentle laxative. Natural salt of magnesium, or magnesium hydroxide helps the colon retain proper fluid levels to help soothe and soften stools. The formula also includes yellow dock root, ginger rhizome, marshmallow root, and slippery elm bark, all intestinal supporting herbs. 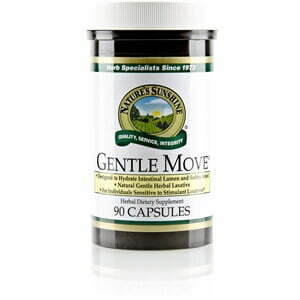 Gentle Move is specifically designed to stimulate and hydrate the intestine. Instructions: Maintenance: Take two capsules at nighttime or before bedtime.